Globally, humanitarian agencies are stressing the need for better partnerships during response, with local NGOs, the private sector, and government administrations. Following the 2010 Haiti earthquake, aid agencies were criticized for not doing enough to include or empower local authorities in emergency responses and recovery efforts. Four years later, IRIN has spoken to Haitians, government officials and aid agencies, to see whether this had changed. Today, one of these clusters, water, sanitation and health, is government-led, and the government has assumed an increasing amount of responsibility in the others. But it will likely require continued support, and in some cases leadership, from aid agencies for some time, said aid workers and government officials in Port-au-Prince. "The capacity of the Haitian authorities has evolved, but it remains weak," said Fools-Gen Sanon, the communal coordinator of Port-au-Prince's Pétion-Ville Commune, which works closely with international actors. "We know how to deal with the [Haitian] people, but we don't have the means to meet their needs. Our capacity has evolved, but that doesn't mean we no longer need help and funding from NGOs," he told IRIN. In some cases, partnership has worked relatively well. The water, sanitation and hygiene (WASH) cluster has been lauded as a success, primarily because its government counterpart, the National Department of Potable Water and Sanitation (DINEPA), was involved in the response from day one. DINEPA's building and personnel, headquartered in the rocky foothills of Port-au-Prince, were largely unaffected by the disaster. Co-run by UNICEF and DINEPA, Haiti's WASH sector received US$30.2 million from the US government. The cluster coordinated agencies that were providing clean water and sanitation services in camps and in returnee neighbourhoods. From the start, the cluster brought in community members to directly voice their concerns, said USAID. The disaster also gave DINEPA an opportunity to improve sanitation in Haiti, said its municipal coordinator, Paul Christian Namphy. "Sanitation was so poor before the earthquake that it actually improved in the response," he said. But serious challenges remain. While 64 percent of Haitians could access improved drinking sources as of 2011 (the most recent statistics available), according to UNICEF, just 26 percent could access improved sanitation facilities. Consuming much of the cluster's attention has been the persistence of an epidemic of cholera, a disease last seen in Haiti at least 100 years ago. The disease has killed 8,000 people and infected nearly 700,000 since 2010. At least improved sanitation within the camps meant the WASH and camp management clusters could help contain the disease's spread within them, said Namphy. "These are small victories inside a bigger defeat. but the fact that cholera was able to take off at all is a failure of the entire emergency response effort," he said. One of the biggest priorities is the relocation of 147,000 internally displaced persons (IDPs) still living in some 270 camps. The camp management cluster will need a minimum budget of US$78 million this year, according to the UN's 2014 humanitarian action plan, but critics say that those numbers are too high four years after the earthquake. The International Organization for Migration (IOM), the cluster lead, says the efforts and funds are producing results. The number of IDPs has dropped by over 90 percent from the original 1.5 million in 2010, they said. "After the earthquake, considering the levels of funding that were available, we would've hoped that it wouldn't have taken this long," said Bradley Mellicker, a disaster risk reduction specialist with IOM and the cluster coordinator. "But there were challenges that we hadn't seen in other places, especially on that scale." These challenges, he said, included: subsequent natural disasters, such as floods and hurricanes; a weak land tenure system filled with fake land titles; violent evictions by people who claimed to be landowners in Port-au-Prince; political instability; the cholera epidemic; extra duties inherited from dissolved clusters; and a decrease in recent funding. Further, "[Humanitarian] funding cycles are short and tend to gear toward quantitative rather than qualitative results," said Mellicker during a Skype interview from the Philippines, where he was temporarily posted to help with relief efforts there. The camp cluster's government partner, the Unit for the Construction of Housing and Public Buildings (UCLBP), is now taking over the effort, even as money grows tighter and international partners are withdrawing from the country. Under these circumstances, the effort to clear IDP camps could slow, say analysts, but the transition is necessary. A child gets her hair braided in Acra 2. A child gets her hair braided in Acra 2. The International Organization for Migration is in the process of clearing the camp. On 5 January, displaced teacher Charles Ivalien and his family moved into their new home, not far from Acra 2 camp in Pétion-Ville where they had been living. "The transition was very smooth," Ivalien told IRIN as he walked around his new neighbourhood. "IOM approved the house, and we moved in shortly thereafter." While it does not compare to his pre-earthquake home, it is much better than the tent he was living in - and it is free for one year with a rental subsidy provided by IOM. The cluster moved away from temporary shelters in 2011, under encouragement by the Haitian government. But like many Haitians, Ivalien mostly blames the government for the slow progress on relocation. "You only have to look at our lives to see the work of the government," he had said before he moved, gesturing to the tents in Acra 2 camp. "It's an ailing country because of who is in charge." But he added: "The government is not evil. They want to change things but in Haiti, that is very difficult. Almost a dream." Although the aid community wants to hand over recovery duties to the Haitian government as soon as possible, there is some wariness among donors to direct aid straight to state coffers. 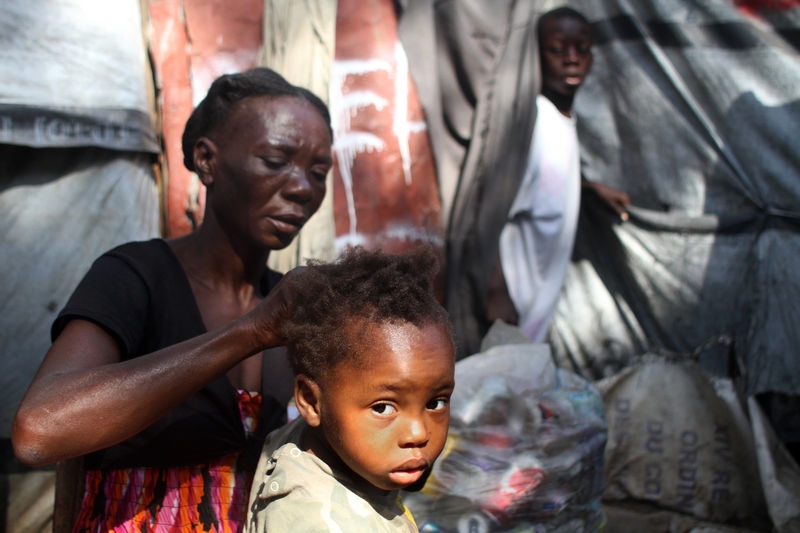 Of the $2.43 billion in emergency aid that was delivered within the first two years of relief efforts, only 1 percent went to the Haitian government, according to UN statistics. Of the $13 billion in recovery funds pledged by donors between the disaster and December 2012, only 9 percent was directed to the government, according to the Office of the Special Envoy for Haiti. Haiti's President Michel Martelly acknowledged the issue in a recent interview with Voice of America, saying that corruption has caused "a lack of confidence in the Haitian system." But he added that things are different today. "I believe they should give us a chance to control Haiti, spend that money the way we feel or we think we have to do it," Martelly said. Yet large-scale demonstrations calling for the president's resignation have grown more frequent. Protesters accuse the government of corruption and criticize its failure to hold legislative elections in the past three years. The overdue elections are now slated for October 2014. The UN's 2014 humanitarian action plan cites "potential political insecurity" as a reason for the likely "deterioration in the operating environment for humanitarian actors." The plan goes on to say that the remaining humanitarian coordination structures are expected to be transferred to the government by the year's end, "unless another major emergency occurs."